NK cells are the first lymphoid population recovering after allogeneic hematopoietic stem cell transplantation and play a crucial role in early immunity after the graft. Recently, it has been shown that human CMV (HCMV) infection/reactivation can deeply influence NK cell reconstitution after umbilical cord blood transplantation by accelerating the differentiation of mature NKG2A−killer Ig-like receptor (KIR)+ NK cells characterized by the expression of the NKG2C-activating receptor. In view of the hypothesis that NKG2C could be directly involved in NK cell maturation driven by HCMV infection, we analyzed the maturation and function of NK cells developing in three patients with hematological malignancies given umbilical cord blood transplantation from donors carrying a homozygous deletion of the NKG2C gene. We show that HCMV infection can drive rapid NK maturation, characterized by the expansion of CD56dimNKG2A−KIR+ cells, even in the absence of NKG2C expression. Interestingly, this expanded mature NK cell subset expressed surface-activating KIR that could trigger NK cell cytotoxicity, degranulation, and IFN-γ release. Given the absence of NKG2C, it is conceivable that activating KIRs may play a role in the HCMV-driven NK cell maturation and that NK cells expressing activating KIRs might contribute, at least in part, to the control of infections after transplantation. Natural killer cells represent crucial effectors in innate immune response to viral infections and tumors. NK cell function is regulated by an array of germline-encoded surface receptors that, upon interaction with ligands, transmit either inhibitory or activating signals (1–3). Most human NK cells express inhibitory receptors specific for HLA class I molecules, including the killer Ig–like receptors (KIRs), able to distinguish among different HLA-A, -B, and -C allotypes (4), as well as the CD94/NKG2A heterodimer, specific for HLA-E (5). These receptors allow NK cells to spare HLA class I+ autologous normal cells and to kill cells in which HLA class I expression is downregulated (e.g., by tumor transformation or viral infection) or cells expressing non-self HLA class I alleles unable to engage inhibitory KIRs (e.g., in the allogeneic transplant settings). Activating counterparts of the inhibitory receptors specific for HLA class I molecules can be expressed by NK cells. 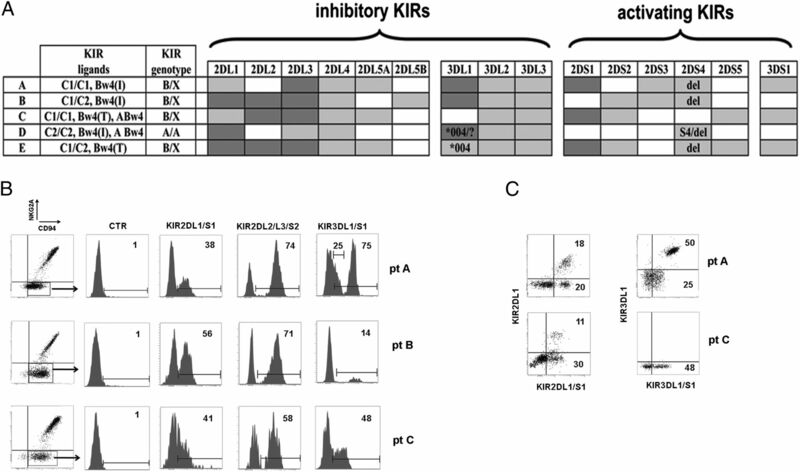 In particular, activating KIRs, including KIR2DS1, KIR2DS2, and KIR3DS1, are highly homologous to their inhibitory counterparts in the extracellular domain but are characterized by a short cytoplasmic tail lacking ITIMs. Alternatively, activating KIRs interact with DAP-12, an adaptor signaling molecule carrying an ITAM that can induce NK cell activation (6). So far, the HLA class I specificity of activating KIRs has been clearly demonstrated only for KIR2DS1 and KIR2DS4 (6–8). KIR genes are located on chromosome 19 and are inherited as haplotypes. Two basic KIR haplotypes can be found in the human genome: group A haplotypes, which have a fixed number of genes that encode inhibitory receptors (with the exception of the activating receptor KIR2DS4), and group B haplotypes, which have variable gene content, including additional activating KIR genes (4, 9). Another HLA class I–specific activating receptor is represented by the HLA-E–specific CD94/NKG2C heterodimer. At variance with its counterpart CD94/NKG2A, which contains an ITIM in the NKG2A cytoplasmic domain, NKG2C, as the activating KIR, is associated with DAP-12 (5). High proportions of NKG2C+ peripheral blood NK cells have been detected in human CMV (HCMV)–seropositive healthy subjects (10). This expanded NKG2C+ NK cell subset is characterized by a KIR+NKG2A− mature phenotype. Increased proportions of KIR+NKG2A−NKG2C+ NK cells have also been described in subjects who experienced other viral infections, including HIV (11, 12), chikungunya virus (13), hantavirus (14), hepatitis B virus, and hepatitis C virus (15). However, it is conceivable that HCMV coinfection/reactivation, which may occur in chronically infected subjects, may be responsible for the induction of such NK cell phenotype in these patients. Another study showed that HCMV-infected fibroblasts could induce the expansion of NKG2C+ NK cells (16). Thus, an emerging concept is that HCMV infection is capable of shaping the NK cell receptor repertoire, favoring the preferential expansion of memory-like NKG2C+KIR+ NK cells and their persistence over time. In this context, we and others (17, 18) have previously shown that HCMV infection/reactivation can promote NK cell maturation in adult patients undergoing umbilical cord blood transplantation (UCBT) for high-risk leukemias. Thus, in such patients, we detected a rapid development of highly differentiated NKG2A−KIR+NKG2C+ NK cells that, similar to what we observed in HIV/HCMV-infected subjects (19), were characterized by marked downregulation of Siglec-7 and, to a lower extent, of CD56. Notably, these NK cell populations, expressing a memory-like surface phenotype, could contribute to protection against leukemia relapse and to control of infections after transplantation (17, 18, 20). In this context, a role for NKG2C+ NK cells has been proposed in the resolution of HCMV infection in a T cell–deficient patient (21). Taken together, these data suggested that the NKG2C receptor could play a role in HCMV recognition, expansion, and/or maturation of NKG2C+ cells and control of virus infection. Interestingly, a homozygous deletion of the NKG2C gene has been reported in 4% of Japanese and European healthy individuals, whereas a heterozygous deletion was present in 32–34% of subjects examined. These data imply that NKG2C is dispensable at least for reproduction and survival (22–24). Nevertheless, the impact of NKG2C genotype on NK cell maturation, receptor repertoire, and function in response to HCMV infection remains to be defined. In this study, we analyzed the phenotype and function of maturing NK cells in three HCMV-infected patients that were given UCBT from a donor carrying a homozygous deletion of the NKG2C gene. Our data indicate that HCMV infection can promote rapid NK cell maturation also in the absence of NKG2C and suggest a relevant role of activating KIRs in this process. In the present study, we analyzed two cohorts of patients undergoing UCBT (one consisting of 14 adults and the other of 10 pediatric cases) for hematological malignancies, mostly acute myeloid leukemia (one patient died within 6 mo after UCBT and was not included in the analysis). Among these, 15 patients experienced HCMV infection after transplantation. After a fully myeloablative regimen, cord blood cells were administered intrabone in adults (25) and i.v. in children. Adult patients were transplanted at Azienda Ospedaliera Universitaria San Martino (Genoa, Italy), whereas pediatric patients were transplanted at the Bambino Gesù Children’s Hospital (Rome, Italy). All patients received a combination of cyclosporin (Novartis Farma, Basel, Switzerland), mycophenolate mofetil (Roche, Welwyn Garden City, U.K.), and anti-thymocyte globulin (Genzyme Cambridge, MA) as graft-versus-host disease prophylaxis. The dose of cyclosporin was adjusted to maintain serum trough levels between 150 and 300 μg/l. After engraftment, cyclosporin was given orally and tapered until discontinuation, ∼1 y after UCBT. Mycophenolate mofetil was administered at a dosage of 15 mg/kg twice a day from day 1 to 28 after transplantation. Rabbit anti-thymocyte globulin was given at a dose of 2−3 mg/kg on days 3 and 2 before transplantation. No patient received steroids for graft-versus-host disease prophylaxis. Either patients or their parents gave their informed consent to be included in this study, which was approved by the Azienda Ospedaliera Universitaria San Martino (Genoa, Italy) and by the Bambino Gesù Children’s Hospital (Rome, Italy) Ethical Committees and was conducted in accordance with the tenants of the Declaration of Helsinki. HCMV serology was assessed prior to transplantation using enzyme-linked immunoassay for virus-specific IgM and IgG. HCMV infection was monitored in the posttransplant period by antigenemia determination, counting HCMV pp65+ cells/2 × 105 PMN cells. Patients were pre-emptively treated in the presence of 2 or more pp65+ PMN cells/2 × 105 (or upon first confirmed positivity, when a single-positive cell was detected). Pre-emptive therapy was based on administration of i.v. ganciclovir (5 mg/kg twice a day), replaced by foscarnet (90 mg/kg twice a day) in case of ganciclovir-induced neutropenia (<0.5 × 109 neutrophils/l) or sustained increase of HCMV levels in blood during therapy with ganciclovir. Antiviral treatment was stopped in the presence of virus clearance from blood, that is, after two consecutive negative results. HCMV relapse episodes were treated similarly. Peripheral blood samples were collected from patients at 1, 3, 6, and 12 mo after transplantation. PBMCs were derived from blood samples by Ficoll-Hypaque gradients (Sigma-Aldrich, St. Louis, MO) and used directly for flow cytometry analyses. The following mAbs, produced in our laboratory, were used in this study: c127 (IgG1, anti-CD16), AZ20 (IgG1, anti-NKp30), BAB281 (IgG1, anti-NKp46), z231 (IgG1, anti-NKp44), BAT221 (IgG1, anti-NKG2D), c218 and FS280 (IgG1 and IgG2a, respectively, anti-CD56), QA79 and Z176 (IgG1 and IgG2b, respectively, anti–Siglec-7 or p75/AIRM1), 11PB6 (IgG1, anti-KIR2DL1 and anti-KIR2DS1), GL183 (IgG1, anti-KIR2DL2/L3-S2), FES172 (IgG2a, anti-KIR2DS4), Z27 (IgG1, anti-KIR3DL1/S1), DF200 (IgG1, anti-KIR2DL1/S1/L2/L3/S2/S5), AZZ158 (IgG2a, anti-KIR3DL1/S1-L2), ECM41 (IgM, anti-KIR2DL3), Q66 (IgM, anti-KIR3DL2), XA185 and Y9 (IgG1 and IgM, respectively, anti-CD94), Z199 and Z270 (IgG2b and IgG1, respectively, anti-NKG2A), andF278 (IgG1, anti–LIR-1). Anti–KIR2DL1-PE, -allophycocyanin, or nonconjugated mAb (clone 143211) and anti-NKG2C (mouse IgG2b) were purchased from R&D Systems (Abingdon, U.K.). Anti–CD56-PC7 (C218 clone), anti–CD3-Pacific Blue (UCHT1 clone), anti–CD19-Pacific Blue (J3-119 clone), and anti–NKG2A-allophycocyanin (Z199 clone) were purchased from Beckman Coulter/Immunotech (Marseille, France). Anti–CD16-PerCP-Cy5.5 (clone 3G8), anti–CD3-Horizon-V500 (UCHT1 clone), anti–CD19-Horizon-V500 (HIB19 clone), anti–KIR2DL2/L3-S2-FITC (CH-L clone), anti–CD107a-PE (anti-LAMP1), and anti–IFN-γ-PE were from BD Biosciences (San Diego, CA). Anti–KIR3DL1-FITC (DX9 clone), anti–KIR2DL2/L3-S2-allophycocyanin (DX27 clone), anti–KIR2DL1-S1 biotin-conjugated (11PB6 clone), and anti-biotin VioBlue mAbs were purchased from Miltenyi Biotec (Bergisch Gladbach, Germany). NK cell phenotype was analyzed on freshly derived PBMCs, gating NK cells by the combined use of anti-CD56, anti-CD3, and anti-CD19 and by physical parameters. Cytofluorimetric analyses were performed on a BD FACSVerse (Becton Dickinson, Mountain View, CA) and data were analyzed by FACSuite software version 1.0.3. To obtain polyclonally activated NK cells, NK cells were purified from PBMCs by negative selection using an NK cell isolation kit (Miltenyi Biotec) and subsequently cultured on irradiated feeder cells in the presence of 100 U/ml recombinant human IL-2 (Proleukin; Chiron, Emeryville, CA) and 1.5 ng/ml PHA (Life Technologies, Paisley, U.K.). The medium used throughout the experiments was RPMI 1640 supplemented with 2 mM l-glutamine, 1% penicillin-streptomycin-neomycin mixture, and 10% heat-inactivated FCS (17). In reverse Ab-dependent cellular cytotoxicity assays, polyclonally activated NK cells were washed and incubated with FcγR+ p815 murine mastocytoma cell line, in the presence or absence of mAbs (5 μg/ml) specific for different surface receptors indicated in the text and figures at an E:T ratio of 1:1 for 3 h in culture medium supplemented with anti–CD107a-PE mAb. Thereafter, cells were stained with anti–CD56-PC7, anti-CD94, and anti-NKG2A mAbs followed by appropriate secondary reagents for 35 min on ice. Cells were then washed and analyzed by flow cytometry (FACSVerse). To detect intracellular production of IFN-γ, polyclonally activated NK cells were washed and incubated with p815 (E:T ratio of 1:1) in the presence or absence of mAbs (5 μg/ml) specific for different surface receptors indicated in the text and figures or with medium alone for 4 h in the presence of GolgiStop (BD Biosciences). Thereafter, cells were washed, stained as described above for CD107a assays, and then fixed and permeabilized with a BD Cytofix/Cytoperm kit from BD Biosciences. IFN-γ production was detected by subsequent intracellular staining with anti–IFN-γ-PE and cytofluorimetric analysis. The percentage of positive cells was calculated by subtracting the baseline CD107a or IFN-γ expression in controls cultures without stimuli from targets. In different degranulation assays, polyclonally activated NK cells were incubated with C1R, a human B cell line lacking surface HLA-A and expressing HLA-B35 at low levels and HLA-Cw4 (6), at an E:T ratio of 1:1 for 3 h in culture medium supplemented with anti–CD107a-PE mAb. Cells were then stained and analyzed as described above. DNA of the tested samples was extracted using QIAamp DNA Blood Mini kit (Qiagen, Hilden, Germany). The presence or absence of the NKG2C gene was determined as previously described (24) with minor modifications. In particular, in each PCR reaction three sets of primers are present: the two primer pairs that allow discriminating between the haplotypes in which the NKG2C gene was present and those in which it was lacking, in combination with the set specific for the NKG2A gene. The PCR condition consisted of an initial denaturation at 95°C for 2 min, followed by 35 cycles: 30 s at 95°C, 30 s at 55°C, and 30 s at 72°C. KIR ligands and the KIR gene profile analyses were performed using Olerup sequence-specific polymorphism–PCR KIR HLA ligand and KIR genotyping kits (GenoVision, Saltsjoebaden, Sweden), respectively, following the manufacturer’s instructions. Wilcoxon–Mann–Whitney nonparametric tests were employed. The statistical significance (p value) is indicated. Graphic representations and statistical analyses were performed using the PASW Statistics version 20.0 software (formerly SPSS Statistics, IBM) (17) and GraphPad Prism 6 (GraphPad Software, La Jolla, CA). Of the 15 patients who experienced HCMV infection after UCBT, 3 (1 adult and 2 children), although displaying early expansion of mature peripheral blood NK cells, did not express NKG2C at the NK cell surface. Phenotypic analysis of NK cells was performed at different time points after transplantation. In agreement with a previous report (17), remarkable differences were detected in terms of NK cell maturation between patients who did or did not experience HCMV reactivation as early as 3 mo after transplantation. Fig. 1A shows results at 6 mo after UCBT (a time period corresponding to the emergence of major phenotypic differences between patients who did or did not experience HCMV reactivation). Patients A, B, and C had high proportions of NKG2A-KIR+ peripheral blood NK cells. Additionally, these NK cells displayed a marked downregulation of surface Siglec-7 both in the CD56dim and in the CD56− NK cell subsets. However, in these three patients, NKG2C was not expressed at any stage of NK cell differentiation after UCBT. For comparison (Fig. 1A), three representative patients from the study cohort who did (patients D and E) or did not have (patient F) HCMV infection are also shown. In line with what we reported in a previous study (17), all the other HCMV-infected patients, including patients D and E, displayed high proportions of NKG2A−KIR+Siglec-7−CD56+/− NK cells that expressed NKG2C. In contrast, all HCMV noninfected patients, including patient F, showed a more immature NK cell phenotype, characterized by low percentages of NKG2A−KIR+ or NKG2C+KIR+ NK cells (Fig. 1A, Supplemental Fig. 1) and by absence of significant downregulation of Siglec-7 and CD56. Lack of NKG2C expression in NK cells developing in patients given UCBT and experiencing HCMV infection. Peripheral blood NK cells were analyzed by multicolor immunofluorescence and FACS analysis in UCBT patients at different time points after transplantation. Phenotypical features of maturing NK cells in six different patients who did (patients A–E) or did not have (patient F) HCMV infection are shown at 6 mo after UCBT in (A) and (B). NK cells were gated from PBMC samples as total CD3−CD19− lymphocytes to include CD56− NK cells in the analyses (17). (A) Peripheral blood NK cells were investigated for the expression of NKG2A in combination with KIR (left column), CD56 in combination with Siglec-7 (middle column), and NKG2C in combination with KIR (right column). The percentage of the different NK cell subsets is shown in the corresponding quadrant of the plots. (B) Peripheral blood NK cells were stained with anti-CD94 and anti-NKG2A mAbs to identify a subset of CD94+NKG2A− NK cells in the different patients. The percentage of this gated population is indicated in the lower left quadrant for each patient shown. NKG2A−CD94+ NK cells were assessed for the expression of the indicated surface Ags (KIR, Siglec-7, and CD16). Horizontal bars represent markers assigned on the basis of cells incubated with secondary reagent/isotype control alone. In each histogram, the percentage of positive cells is shown. (C) Peripheral blood NK cells from patients A (●), B (▪), and C (▴) were analyzed for the expression of NKG2A in combination with KIR at 1, 3, 6, and 12 mo after transplant. Symbols represent the percentage of KIR+NKG2A− NK cells for each patient at the different time points, and the bar represents the mean percentage of the three patients. (D) The percentage of KIR+NKG2A− peripheral blood NK cells are shown as 95% CI for the mean at the different time points in different groups of patients (×, HCMV-infected patients lacking surface expression of NKG2C, n = 3; ▼, HCMV-infected patients NKG2C+, n = 11; ♦, noninfected patients NKG2C+, n = 9). (E) NKG2C gene PCR analysis was performed in five patients (A, B, C, D, and E) to determine the presence or the absence of the NKG2C deletion. In each PCR reaction the amplification of an NKG2A segment was used as internal control. Lane M shows molecular mass markers (100 bp ladder), lanes 1–3 show the three patients characterized by NKG2C homozygous deletion (NKG2C−/−) (lane 1, patient A; lane 2, patient B; lane 3, patient C), lane 4 shows patient D typed as heterozygous (NKG2C+/−), lane 5 shows patient E carrying two NKG2C+ haplotypes (NKG2C+/+), and lane 6 is the negative control. Notably, patients A, B, and C, who lacked NKG2C surface expression, showed an expansion of a NK subset characterized by the NKG2A−CD94dim phenotype. As shown in Fig. 1B, this NK cell subset had a phenotypic signature compatible with fully mature NK cells (26), being mostly composed of KIR+CD16bright cells. Alternatively, in patients D and E the expanded CD94dimNKG2A− NK subset was largely NKG2C+ (data not shown), whereas in patient F, differently from what observed in the infected ones, the NKG2A−CD94+ NK cell subset was poorly represented and was Siglec-7+ (Fig. 1B). The expanded CD94+NKG2A− NK cell subset of all HCMV-infected patients also expressed substantial amounts of CD57, a marker characteristic of terminal NK cell differentiation (27) (data not shown). In all patients, including those who had HCMV infection, the NKG2A+CD94+ NK subset displayed a more immature phenotype, characterized by low levels of KIR and by the expression of Siglec-7 (Supplemental Fig. 1). As shown in Fig. 1C and 1D, the percentages of KIR+NKG2A− NK cells progressively increased from month 1 to month 12 after UCBT, both in HCMV-infected patients lacking surface NKG2C expression and in HCMV-infected NKG2C+ patients. Altogether these observations indicate that in patients undergoing UCBT, HCMV infection can promote the expansion of CD94+KIR+NKG2A− mature NK cells even in the absence of NKG2C surface expression. Of note also, in patients lacking NKG2C, downmodulation of Siglec-7 in the CD56dim subset would represent a useful NK cell marker to reveal HCMV reactivation. The lack of NKG2C surface expression in patients A, B, and C (Fig. 1A) could be consequent to a homozygous NKG2C deletion. To detect the presence of the NKG2C gene, we used a PCR primer pair that allows the amplification of a segment of NKG2C exon 6. NKG2C deletion was assessed by a PCR primer set that selectively amplifies a segment, around the breakpoint, only present in the NKG2C-deleted haplotype. As an internal control, amplification of a NKG2A segment was performed (24). The PCR reactions gave rise to products of different lengths. Thus, a single reaction, including the three sets of primers, was sufficient for characterizing the samples as homozygous for the presence of the NKG2C gene (NKG2C+/+), homozygous for NKG2C deletion (NKG2C−/−), or heterozygous (NKG2C+/−). As shown in Fig. 1E, patients A, B, and C were homozygous for NKG2C deletion. On the contrary, patients D and E, with a NKG2C+ surface phenotype, were typed as NKG2C+/− and NKG2C+/+, respectively. The analysis of the KIR genotype indicated that all three NKG2C−/− patients were characterized by at least one group B KIR haplotype (Fig. 2A). In particular, patient A could potentially express KIR2DS1 and KIR3DS1, patient B KIR2DS2, and patient C KIR2DS1, KIR2DS2, KIR2DS5, and KIR3DS1. In an attempt to identify the presence of these activating KIRs in the CD94+NKG2C−NKG2A−KIR+ NK cell subset, we analyzed fresh NK cells from these patients by using combinations of appropriate mAbs. In the representative experiment shown in Fig. 2B and 2C, NK cells were analyzed at 6 mo after UCBT. Most CD94+NKG2C−NKG2A− NK cells expressed self-reactive inhibitory KIRs (the corresponding KIR ligands are listed in Fig. 2A); thus, in patient A, these expanded NK cells were KIR2DL3+ (74%) and KIR3DL1+ (50%), but they expressed also substantial percentages of KIR3DS1 (25%; detected as DX9–Z27+ cells) (Fig. 2C) whereas 20% of cells expressed KIR2DS1 (Fig. 2C; detected as 143211−11PB6+ cells) (28). Being derived from an HLA C1/C1 donor, KIR2DS1+ cells were expected to be licensed and thus functionally competent (29). Importantly, most KIR2DS1+ and KIR3DS1+ NK cells (92 and 75%, respectively) coexpressed the self-KIR KIR2DL3 (not shown). In patient B, CD94+NKG2C−NKG2A− NK cells were KIR2DL1+ (56%) and KIR2DL2/L3-S2+ (71%). This patient was expected to express also KIR2DS2; however, the size of KIR2DS2+ NK subset could not be determined because of the lack of mAbs discriminating between KIR2DL2 and KIR2DS2. Patient C expressed KIR2DL2/L3, but not KIR3DL1, absent in the KIR genotype (Fig. 2A). The CD94+NKG2C−NKG2A− cells of patient C were 48% KIR3DS1+ and 30% KIR2DS1+ (Fig. 2C). Also in this case, the size of the KIR2DS2+ NK subset could not be determined. Regarding the CD94+NKG2A+ NK subset, the expression of KIRs was low in all three patients (Supplemental Figs. 1B, 2). Taken together, these data indicate that in patients transplanted from NKG2C−/− donors and experiencing HCMV infection, the expanded KIR+NKG2A−Siglec-7− mature NK cell subset is characterized by the expression of activating KIRs. CD94+NKG2A−NKG2C−KIR+ NK cells from patients transplanted from NKG2C−/− donors express activating KIR. (A) Donor genotypes were analyzed for the presence (gray boxes) or absence (white boxes) of the indicated KIR genes using sequence-specific polymorphism–PCR approach. Two different sets of primers were used to discriminate between the KIR2DS4 alleles coding for membrane-bound receptors (reported as S4) and the alleles coding for putative soluble receptors (reported as del.). KIR3DL1*004 indicates the presence of a KIR3DL1 allele coding for intracellularly retained receptor. KIR3DL1*004/? indicates the presence of at least one KIR3DL1 allele coding for intracellularly retained receptor. Dark gray boxes indicate educated. KIRs A/A indicates that the sample is homozygous for group A KIR haplotypes. B/X indicates genotypes containing either one (A/B heterozygous) or two (B/B homozygous) group B haplotypes. Peripheral blood NK cells, derived from patients A, B, and C, were stained with anti-CD94 and anti-NKG2A mAbs to identify the expanded subset of CD94+NKG2A−NKG2C− NK cells. (B) The CD94+NKG2A−NKG2C− NK cell subset was assessed for the expression of the main KIR receptors. Horizontal bars represent markers assigned on the basis of cells incubated with secondary reagent/isotype control alone. In each histogram, the percentage of positive cells is shown. (C) The CD94+NKG2A−NKG2C− NK cell subset in both patients A and C was analyzed by the combination of appropriate mAbs to detect the expression of activating KIR. Left plots, Staining of NK cells by the combined use of an anti-KIR2DL1 mAb (143211 clone) with an anti–KIR2DL1-S1 mAb (11PB6 clone). The percentage of single-positive KIR2DS1+ NK cells, detected as KIR2DL1−/KIR2DL1-S1+, is indicated in the lower right quadrant. Right plots, Staining of NK cells by the combined use of an anti-KIR3DL1 (DX9 clone) with an anti-KIR3DL1/S1 mAb (Z27 clone). The percentage of single-positive KIR3DS1+ NK cells, detected as KIR3DL1−/KIR3DL1/S1+, is indicated in the lower right quadrant. To obtain sufficient numbers of NK cells for evaluating the function of activating KIRs in the expanded NKG2C−NKG2A−CD94+ NK cell subsets, polyclonal NK cell populations were generated in the presence of recombinant human IL-2. In these NK cells, the NKG2C−NKG2A−CD94+ NK cell subset maintained the Siglec-7− phenotype and a percentage of activating KIRs similar to those found in NK cells recovered from peripheral blood (Fig. 3). The apparent increases of KIR3DS1+ cells may reflect the higher density per cell of this receptor in recombinant human IL-2–cultured NK cells. 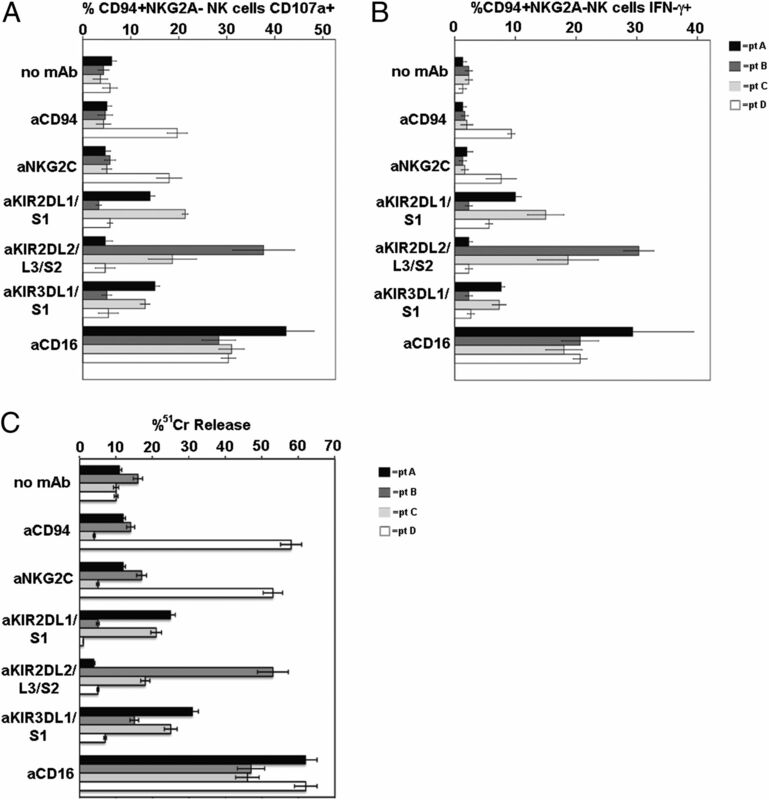 Expression of activating KIR in IL-2–cultured CD94+NKG2A−NKG2C−KIR+ NK cells from patients transplanted with NKG2C−/− UCB. (A) Polyclonally activated NK cells derived from patients A, B, C, and D were stained with anti-CD94 and anti-NKG2A mAbs to identify the CD94+NKG2A− NK cell subset (the percentage is shown in the lower left quadrant). This population was then assessed for the surface expression of the indicated molecules. Horizontal bars represent markers assigned on the basis of cells incubated with secondary reagent/isotype control alone. In each histogram the percentage of positive cells is shown. (B) The same CD94+NKG2A−NKG2C− NK cell subsets were analyzed by the combination of appropriate mAbs to detect the expression of activating KIR. Left plots, Staining of NK cells by the combined use of an anti-KIR2DL1 mAb (143211 clone) with an anti–KIR2DL1-S1 mAb (11PB6 clone). The percentage of single-positive KIR2DS1+ NK cells, detected as KIR2DL1−/KIR2DL1-S1+, is indicated in the lower right quadrant. Right plots, Staining of NK cells by the combined use of an anti-KIR3DL1 (DX9 clone) with an anti-KIR3DL1/S1 mAb (Z27 clone). The percentage of single-positive KIR3DS1+ NK cells, detected as KIR3DL1−/KIR3DL1/S1+, is indicated in the lower right quadrant. To assess the ability of activating KIRs to trigger NK cell effector functions, NK cells from patients A, B, C, and D were analyzed for degranulation (CD107a expression) and IFN-γ release in reverse Ab-dependent cellular cytotoxicity (ADCC) experiments, either in the presence or in the absence of anti-KIR mAbs. As shown in Fig. 4A and 4B, gating on CD94+NKG2A− NK cells revealed that mAb-mediated triggering of different activating KIRs could induce both degranulation and IFN-γ production. Importantly, based on the results of these experiments, we could infer that KIR2DS2+ cells were present in NK cells of both patients B and C. The size of this subset should correspond at least to the percentage of CD107a+ NK cells, detected upon triggering with anti–KIR2DL2/L3-S2 mAb (i.e., 38% for patient B and 24% for patient C). However, we cannot exclude that the actual size of this subset was underestimated. Indeed, in NK cells coexpressing the inhibitory and the activating forms, the KIR2DL2/L3-mediated inhibitory signal could override the activating signal transduced by KIR2DS2. With regard to KIR3DS1, which was expressed in patients A and C, we found a substantial degranulation (Fig. 4A) but only weak IFN-γ release (Fig. 4B). Triggering of NK cell function by activating KIR expressed by CD94+NKG2A−NKG2C−KIR+ NK cells from patients transplanted with NKG2C−/− UCB. NK cells from patients A, B, C, and D were incubated with the FcγR+ p815 murine cell line in the presence or absence of mAbs specific for CD94, NKG2C, KIR2DL1-S1, KIR2DL2/L3-S2, KIR3DL1/S1, or CD16. CD107a expression (A) or intracellular IFN-γ production (B) was evaluated after gating on the CD94+NKG2A− NK cell subset. Results are shown as percentage of CD107a+ or IFN-γ+ NK cells (95% CI for the mean of six independent experiments). (C) Cytolytic activity of polyclonally activated NK cells derived from patients A–D was evaluated in a 51Cr-release redirected killing assay in the presence or absence of mAbs specific for the same receptors indicated above for panels (A) and (B). Results are shown as 95% CI for the mean of six independent experiments. In all panels black histograms represent patient A, dark gray histograms patient B, light gray histograms patient C, and white histograms represent patient D.
Fig. 4A and 4B also show that mAb-mediated cross-linking of CD94 in reverse ADCC assay induced neither degranulation nor IFN-γ production in CD94+NKG2A−NKG2C− NK cells of patients A, B, and C. On the contrary, in patient D (characterized by CD94 associated with NKG2C in NKG2A− NK cells) cross-linking of CD94 resulted in expression of CD107a and production of IFN-γ in a fraction of CD94+NKG2A− cells (Fig. 4A, 4B, Supplemental Fig. 3). These results were also confirmed by classical 51Cr-release redirected killing assays using patient NK cells as effectors (Fig. 4C). Previous studies revealed that HCMV infection induces a persistent reconfiguration of the NK cell compartment characterized by the expansion of an NK cell subset expressing the activating NKG2C receptor. This finding has been demonstrated both in healthy individuals and in patients with different pathological conditions (10–16, 30, 31). Remarkably, in patients undergoing UCBT, HCMV infection/reactivation markedly influenced NK cell reconstitution, promoting the rapid appearance and expansion of NKG2C+KIR+NKG2A−Siglec-7− NK cells (17, 18). These studies suggested that the NKG2C activating receptor could play a crucial role in NK cell expansion and/or maturation driven by HCMV infection. In the present study, we analyzed the maturation and function of NK cells developing in three patients transplanted with cord blood cells from donors carrying homozygous deletion of the NKG2C gene and undergoing HCMV infection. These cases offered a unique opportunity to analyze the features of NK cell maturation in the absence of the NKG2C receptor. Our data clearly indicate that even in the absence of NKG2C, viral infection induces accelerated acquisition of a mature NK cell phenotype, similar to that described in patients transplanted from an NKG2C+ donor. In particular, increased proportions of CD56dim, KIR+, NKG2A− NK cells were detected already at 3 mo and continued to increase at 6 mo and 1 y after the allograft. Thus, at least in individuals transplanted with NKG2C−/− cord blood cells, the accelerated NK cell development observed after HCMV infection is mediated by NKG2C-independent mechanisms. Remarkably, the expanded subset present in these patients expressed activating KIR. This may suggest that, in these patients, activating KIR could replace NKG2C in determining a more rapid development of mature NK cells. HCMV-driven selective expansion of NKG2C+KIR+ NK cells has been detected in different clinical settings, including hematopoietic stem cell transplantation (HSCT) (17, 18), solid organ transplantation (32), congenital immunodeficiencies (21, 33), and other acute or chronic viral infections (14, 15). The mechanism responsible for this expansion is still unclear. It has been suggested that NK cells could be stimulated by HCMV-infected targets through the heterodimer CD94/NKG2C. In this context, HCMV-infected fibroblasts have been shown to favor the expansion of NKG2C+ NK cells cultured in the presence of either IL-15 or IL-2. mAb-mediated masking of CD94 could inhibit this selective expansion (16). Other studies reported that NKG2C+ NK cells can undergo proliferation when cocultured with HLA-E–transfected 721.221 (34) or K562 cell lines (14). It is possible that HCMV-infected targets express ligands interacting with NKG2C+ NK cells and inducing their activation and proliferation. Remarkably, the signal peptide of the HCMV UL40 protein stabilizes HLA-E expression on HCMV-infected fibroblasts, whereas other HCMV-derived peptides (including US2, US3, US6, US10, and US11) inhibit the surface expression of classical HLA class I molecules (35). These findings suggest that when interacting with HCMV-infected cells, mature NK cells expressing inhibitory self KIRs may selectively expand because of the lack of inhibitory interactions with classical HLA class I molecules. Moreover, the stabilization of HLA-E, although favoring the expansion of NKG2C+ cells, could inhibit proliferation of cells expressing the inhibitory NKG2A receptor. In the UCBT recipients analyzed in this study, HCMV infection induced skewing of the NK cell receptor repertoire toward a mature KIR+ phenotype through a mechanism independent from NKG2C. It is thus conceivable that other activating NK receptors could be involved in this phenomenon. Although the expanded NK cell population expressed surface CD94 molecules, CD94 cross-linking did not transmit triggering signals and failed to induce cytotoxicity, degranulation, and cytokine release. Thus, we considered the possible involvement of the activating KIRs. In this context, a number of studies suggested that the group B KIR haplotype is protective from viral infections, with the activating KIR being capable of responding to virus-infected cells (36). For example, in HIV-seropositive individuals coexpressing KIR3DS1 and HLA-Bw4, progression toward AIDS is delayed (37). A reduced risk of HCMV reactivation has been reported in solid organ transplantation recipients carrying more than one activating KIR (38, 39), as well as in patients given HSCT from donors expressing more than one activating KIR (40). The best protective effect was detected in patients whose donors had a KIR genotype with more than five activating KIRs or containing simultaneously KIR2DS2 and KIR2DS4 (41). These studies analyzed KIR genotypes and/or KIR transcripts in HSCT donor/recipient pairs, but they did not analyze the effective size of NK cell subsets expressing activating KIRs or whether such KIRs were functional. Remarkably, the three NKG2C−/− patients analyzed in this study carried the group B KIR haplotype, and their expanded NKG2A−NKG2C−CD94+ NK cell subset expressed relevant amounts of activating KIR on NK cell surface (Figs. 2, 3). In patients A and C we could establish the proportions of KIR2DS1+ and KIR3DS1+ NK cells by phenotypic analysis using appropriate mAbs. In contrast, a precise determination of KIR2DS2+ cells was not possible in patients B and C due to the lack of mAbs discriminating between KIR2DS2 and KIR2DL2 present in their KIR genotype. However, we could infer a remarkable expansion of KIR2DS2+ cells by functional assays (Fig. 4), in which these NK cells could degranulate and produce IFN-γ in reverse ADCC assays (Fig. 4A, 4B). On this basis, we speculate that NK cells lacking NKG2C, but expressing activating KIRs, could be triggered through these receptors by HCMV-infected targets. In line with this hypothesis is a recent study (34) reporting the expansion of NKG2A−NKG2C− NK subsets expressing activating KIRs in a minority of HCMV-seropositive healthy individuals. However, these subjects were not characterized by the homozygous deletion of the NKG2C gene. Although not shown here, we observed expression of activating KIR also in HCMV-infected patients displaying NKG2C+ NK cell expansions (e.g., KIR2DS4 in patient D). However, the expansion of NKG2C+ cells, induced during HCMV infection, does not require expression of activating KIR as formally demonstrated by the finding that in three patients carrying the KIR A/A haplotype the KIR2DS4 gene was encoding for a non–membrane-bound receptor (not shown). In mice, NK cells expanding during murine CMV infection are characterized by the expression of the activating receptor Ly49H, which specifically recognizes the m157 glycoprotein encoded by murine CMV (42, 43). In humans, the HCMV-induced expansion of NK cells expressing NKG2C may suggest that this activating receptor could represent the human counterpart of murine Ly49H. However, differently from the murine model, the nature of the putative viral ligands recognized by NKG2C has yet to be identified. This holds true also for the viral ligands that might be recognized by the activating KIRs, whereas the specificity of these receptors for HLA class I molecules has been deciphered only for KIR2DS1 and KIR2DS4 (6–8). In this context, NK cells expressing KIR2DS1 (specific for HLA-C2) detected in patients A and C were derived from an HLA C1/C1 homozygous donor. Thus, in agreement with the rule of activating KIR education proposed by Fauriat et al. (29) and in line with data obtained in patients given HSCT (28), NK cells expressing KIR2DS1 were present in high proportions and responded promptly in reverse ADCC experiments to KIR2DS1-reactive mAb. Moreover, these cells displayed enhanced degranulation in CD107a assays against C2+ target cells, including C1R (Cw4+, B35low) (Supplemental Fig. 4) and Cw4-transfected 221 lymphoblastoid cell lines (not shown). Thus, in these cells the function of KIR2DS1 does not appear to be greatly affected by the coexpression of inhibitory KIRs necessary for their education (mostly KIR2DL2/3, which reacts strongly with C1 but weakly with C2), at least when target cells are C1− (as it might occur in certain KIR-mismatched HSCT settings). Whether NK cells equipped with activating KIRs may play a role in controlling HCMV infection/reactivation is not known. It is possible that this expanded NK cell subset, either directly or by cooperating with emerging T cells, could protect from viral reactivations. However, based on the finding that all patients receiving NKG2C−/− cord blood cells experienced HCMV infection, we could also speculate that the absence of NKG2C could confer more susceptibility to HCMV infection. In this regard, it is noteworthy that NKG2C deletion has been associated with a higher risk of HIV infection and to faster disease progression (44). Alternatively, a recent report on a cohort of children with or without congenital HCMV infection showed that the deletion of one copy of NKG2C did not correlate with a higher incidence of HCMV infection (45). Along this line, in our group of patients we observed that following the administration of antiviral therapy immediately after the first detection of HCMV viremia (usually within 30–45 d after UCBT), the infection was cleared by month 6, independently of the NKG2C genotype. Indeed, more specific studies need to be performed to clarify the actual role of both activating KIRs and NKG2C in antivirus responses. Toward this end, it would be relevant to analyze phenotype and function of NK cells derived from individuals carrying a homozygous deletion of NKG2C, a KIR A/A genotype, and missing the expression of all of the surface activating KIRs (i.e., individuals carrying two KIR2DS4 alleles coding for nonmembrane KIR2DS4). Unfortunately, none of the UCB transplanted individuals and none of the healthy CMV+ donors analyzed so far displayed all of these characteristics. In conclusion, our study indicates that in patients receiving UCBT from donors carrying a homozygous deletion of NKG2C, HCMV infection/reactivation can still drive a rapid NK cell maturation characterized by the expansion of CD56dimNKG2A−NKG2C− KIR+ cells. This NK subset contains high proportions of cells expressing activating KIRs that trigger NK cell cytotoxicity, degranulation, and IFN-γ release. It is conceivable that activating KIRs may play a role in the mechanism leading to HCMV-dependent NK cell maturation and that NK cells expressing these receptors may contribute, at least in part, to the control of infections after transplantation. A.M. is a founder and shareholder of Innate-Pharma (Marseille, France). The other authors have no conflicts of interest. We are grateful to the staffs at the Department of Onco-Hematology (Ospedale Bambino Gesù, Rome, Italy) and at the Stem Cell Center (Azienda Ospedaliera San Martino, Genoa, Italy) for help in providing samples. This work was supported by Investigator Grants 10643 (to A.M.), 10225 (to L. Moretta), 5544 (to F.F. ), and Special Project 5x1000 No. 9962 (to A.M., L. Moretta, and F.L.) from Associazione Italiana Ricerca sul Cancro; Ministero dell'Istruzione, dell'Università e della Ricerca (M.I.U.R.) PRIN 2010 (Progetto di Rilevante Interesse Nazionale, to F.L. ); and Progetto Ricerca Ateneo 2012 (to M.D.C.). 1998. NK cell receptors. Annu. Rev. Immunol. 16: 359–393.
. 1995. Existence of both inhibitory (p58) and activatory (p50) receptors for HLA-C molecules in human natural killer cells. J. Exp. Med. 182: 875–884.
. 2007. KIR2DS1-positive NK cells mediate alloresponse against the C2 HLA-KIR ligand group in vitro. J. Immunol. 179: 854–868.
. 2009. KIR2DS4 is a product of gene conversion with KIR3DL2 that introduced specificity for HLA-A*11 while diminishing avidity for HLA-C. J. Exp. Med. 206: 2557–2572.
. 2002. Killer Ig-like receptor haplotype analysis by gene content: evidence for genomic diversity with a minimum of six basic framework haplotypes, each with multiple subsets. J. Immunol. 169: 5118–5129.
. 2006. 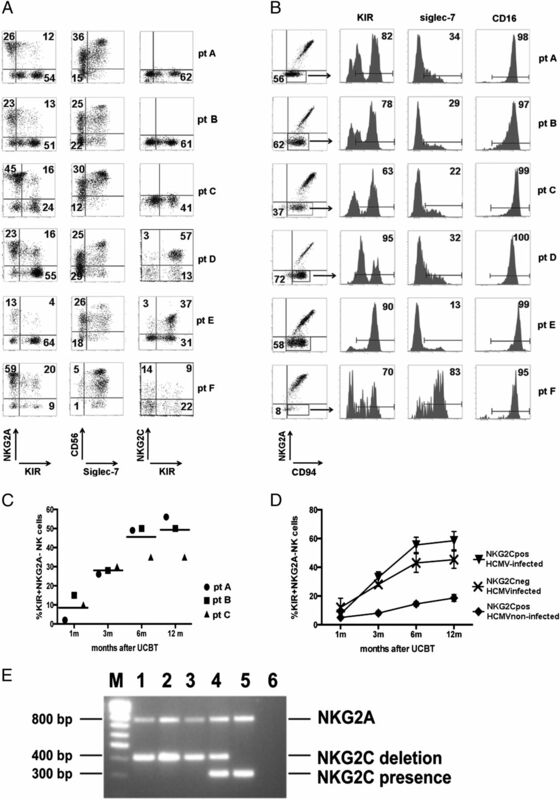 Expansion of CD94/NKG2C+ NK cells in response to human cytomegalovirus-infected fibroblasts. Blood 107: 3624–3631.
. 2012. Phenotypic and functional heterogeneity of human NK cells developing after umbilical cord blood transplantation: a role for human cytomegalovirus? Blood 119: 399–410.
. 2009. The decreased expression of Siglec-7 represents an early marker of dysfunctional natural killer-cell subsets associated with high levels of HIV-1 viremia. Blood 114: 3822–3830.
. 2012. Human cytomegalovirus (CMV)-induced memory-like NKG2C+ NK cells are transplantable and expand in vivo in response to recipient CMV antigen. J. Immunol. 189: 5082–5088.
. 2003. Variations of human killer cell lectin-like receptors: common occurrence of NKG2-C deletion in the general population. Genes Immun. 4: 160–167.
. 2012. Assessment of copy-number variation in the NKG2C receptor gene in a single-tube and characterization of a reference cell panel, using standard polymerase chain reaction. Tissue Antigens 80: 184–187.
. 2008. Direct intrabone transplant of unrelated cord-blood cells in acute leukaemia: a phase I/II study. Lancet Oncol. 9: 831–839.
. 2010. NK cell terminal differentiation: correlated stepwise decrease of NKG2A and acquisition of KIRs. PLoS ONE 5: e11966.
. 2009. Anti-leukemia activity of alloreactive NK cells in KIR ligand-mismatched haploidentical HSCT for pediatric patients: evaluation of the functional role of activating KIR and redefinition of inhibitory KIR specificity. Blood 113: 3119–3129.
. 2010. Education of human natural killer cells by activating killer cell immunoglobulin-like receptors. Blood 115: 1166–1174.
. 2012. Spotlight on NKG2C and the human NK-cell response to CMV infection. Eur. J. Immunol. 42: 3141–3145.
. 2011. Expansion of a unique CD57+ NKG2Chi natural killer cell subset during acute human cytomegalovirus infection. Proc. Natl. Acad. Sci. USA 108: 14725–14732.
. 2013. Persistence of natural killer cells with expansion of a hypofunctional CD56−CD16+KIR+NKG2C+ subset in a patient with atypical Janus kinase 3-deficient severe combined immunodeficiency. J. Allergy Clin. Immunol. 131: 1230–1233.e2.
. 2000. Viral subversion of the immune system. Annu. Rev. Immunol. 18: 861–926.
. 2006. KIR and disease: a model system or system of models? Immunol. Rev. 214: 186–201.
. 2008. The number of activating KIR genes inversely correlates with the rate of CMV infection/reactivation in kidney transplant recipients. Am. J. Transplant. 8: 1312–1317.
. 2011. Telomeric rather than centromeric activating KIR genes protect from cytomegalovirus infection after kidney transplantation. Am. J. Transplant. 11: 1302–1307.
. 2006. Donor KIR genotype has a major influence on the rate of cytomegalovirus reactivation following T-cell replete stem cell transplantation. Blood 107: 1230–1232.
. 2009. The effect of single and combined activating killer immunoglobulin-like receptor genotypes on cytomegalovirus infection and immunity after hematopoietic cell transplantation. Biol. Blood Marrow Transplant. 15: 315–325.
. 2012. NKG2C deletion is a risk factor of HIV infection. AIDS Res. Hum. Retroviruses 28: 844–851.